Theresa May has set out plans to short circuit parliamentary rules in order to get a Brexit deal ratified in time for the UK to leave the EU on March 29. The Prime Minister told MPs that she would enable the House of Commons to lift a requirement for a 21-day delay before any vote to approve an international treaty. But Labour pledged to oppose the move, accusing the Government of showing “contempt for our democracy”. We can deliver for the people and the communities that voted for change two and half years ago – and whose voices for too long have not been heard. We can honour the result of the referendum. The announcement came as Mrs May urged MPs to “hold their nerve” and support her efforts to secure a withdrawal deal which will deliver Brexit on time. In a statement updating the Commons on progress in talks, Mrs May acknowledged she would need “some time” to seek legally-binding changes from the EU to the controversial backstop for the Irish border. She confirmed that she will table an amendable motion for debate on Thursday, seeking the House’s continued support for her to demand “alternative arrangements” to keep the border open after Brexit. And she pledged to return on February 26 with a further statement – triggering another debate and votes the following day – if she has not secured a deal by that date. If a deal is agreed, MPs will have a second “meaningful vote”, like the one in January which saw Mrs May’s original plan rejected by a record-breaking 230 votes. However, a cross-party group of MPs has said that if there is no a deal at that point they will launch another attempt to force the Government to reach a decision on Brexit by mid-March at the latest. The group including Labour MP Yvette Cooper and Tory former ministers Sir Oliver Letwin and Nick Boles said their plan was designed to prevent the country drifting into a no-deal Brexit “by accident”. They intend to put down an amendment creating parliamentary time for a bill requiring the Prime Minister and Parliament to decide by mid-March whether the UK is leaving with a deal, without a deal or whether it will seek an extension to the Article 50 withdrawal process. The February 27 votes are expected to come shortly after Mrs May’s planned meeting with European Commission President Jean-Claude Juncker, at which changes or additions to the Withdrawal Agreement could be agreed. 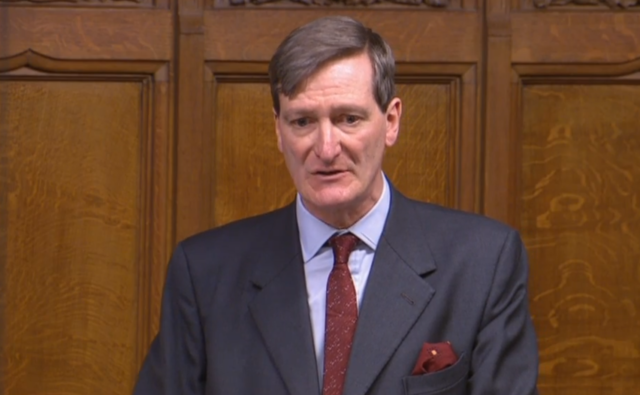 With 45 days to go, former attorney general Dominic Grieve warned that time was running perilously short for ratification of any deal under the terms of the Constitutional Reform and Governance Act. The Act, passed by Gordon Brown’s administration in 2010, requires 21 sitting days before the ratification of any international treaty. But Mrs May responded: “In most circumstances, that period may be important in order for this House to have an opportunity to study that agreement. “But of course, in this instance MPs will already have debated and approved the agreement as part of the meaningful vote. Labour Brexit spokesman Paul Blomfield said: “This plan shows contempt for our democracy. But the PM’s official spokesman pointed out that by the time the 21-day period to consider the Brexit treaty kicked in, MPs would already have passed judgment on it in the “meaningful vote” and the Withdrawal Agreement Bill. “It’s very hard to see a circumstance where having voted to pass the deal and then voted to enshrine its provisions in law, Parliament could hold up our exit in order to allow MPs to read the treaty,” said the spokesman. The process would be accelerated by a clause in the Withdrawal Agreement Bill itself, which would disapply the terms of the 2010 Act in this case, he said. Mrs May sidestepped demands from several MPs to spell out whether she would ask the EU for an extension to the two-year Brexit negotiation process or allow the UK to crash out without a deal if she hit the March 29 deadline with no agreement. In stormy exchanges in the Commons, the SNP’s Westminster leader Ian Blackford risked being thrown out of the chamber after shouting “liar” at the PM. And Labour leader Jeremy Corbyn suggested the PM was “running down the clock” on Brexit in the hope that MPs will be “blackmailed” by the fear of a no-deal outcome into supporting “a deeply flawed deal”. “This is an irresponsible act,” said Mr Corbyn. The PM told the Commons: “We now all need to hold our nerve to get the changes this House requires and deliver Brexit on time.